Visit uk.xtremetape.eu for more information. MOCAP's Silicone X-Treme Tape™ is made from a special silicone material which sticks or bonds only to itself. X-Treme Tape™ has NO ADHESIVE and leaves no residue when removed. MOCAP silicone tape stretches up to 300% and conforms to irregular shapes. Silicone X-Treme Tape™ fuses only to itself and creates a permanent air and liquid tight seal. 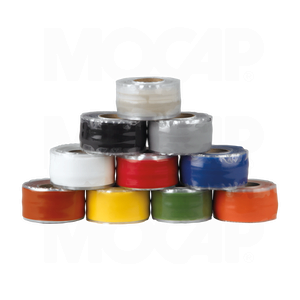 MOCAP silicone tape is excellent for wrapping cables and wire, will insulate to 8000 Volts, will not melt up to 260°C (500°F), and resists UV and weathering like no other tape. Available in 25.4mm (1") and 38.1mm (1-1/2") widths, 3m (10-ft) and 11m (36-ft) length rolls. Silicone Tape for automotive, marine, electrical, e-coating and other applications.